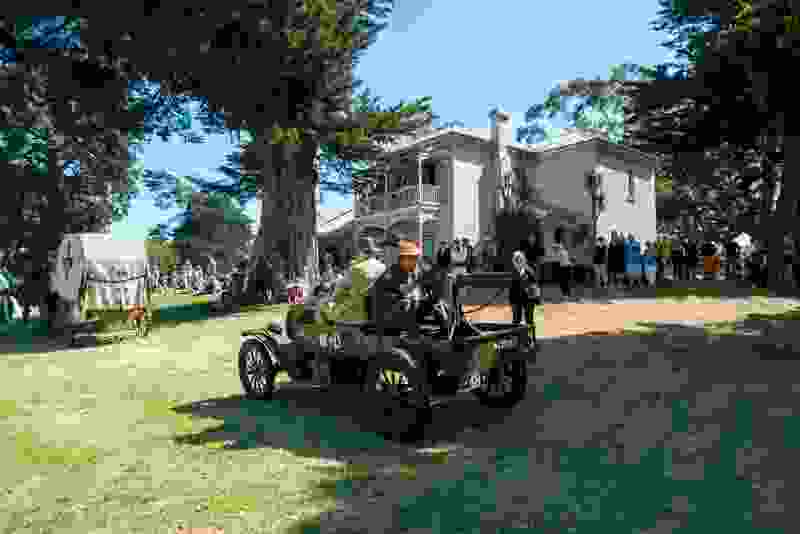 Harewood House, 3310 South Gippsland Highway, Koo Wee Rup (next door to the Tooradin Air Field) is a privately owned, heritage listed property that is occasionally opened for charity events. It was completed in 1868 on a sandy rise on the northern shore of Western Port Bay for pastoralist William Lyall on the clan lands of the Yallock Bulluk people. Plans were drawn up by the Melbourne architect of Italian origin, Alessandro Martelli. The builder was George Binding. Traditional owners Jimmy (Yamerboke) and Eliza (Toolumn) Dunbar had connections with the property and Aboriginal Protector William Thomas recorded the local aboriginal people catching 500 eels in Kirkbelesse (Lyall’s Inlet) in February, 1841. Edwin Cockayne held a lease on the site from the mid-1840s and operated a ferry service taking travellers across the creeks that ran into Western Port. The Lyall family acquired the property in 1853. A weatherboard stable building, dating from the 1850s, still survives on the site. William Lyall was born in Scotland, migrated to Port Phillip by way of Van Diemen’s Land in 1847. He married Annabella Brown from Glasgow in Launceston in 1849 and took up several pastoral runs throughout the colony. He was a partner in a leading Melbourne firm of stock agents. During the late nineteenth century Harewood was the centre of social life in the Western Port district, and notable guests were entertained there, including John Francis, Premier of Victoria and Lord Hopetoun, Governor of Victoria and later the first Australian Governor-General. Lyall was a prominent member of the Acclimatisation Society, and introduced Victoria’s first hares (which gave the name to the property) and Shetland ponies, as well as partridges, deer, pheasants, shaggy highland cattle and plants including Scottish gorse and camellias. His interests were wide-ranging: he imported stud Hereford cattle, Cotswold sheep and Thoroughbred horses for racing and breeding; he unsuccessfully attempted oyster culture in Western Port over the 1870s; he imported a brick-making machine in 1876 to supply the district with bricks; and he lost money in unsuccessful attempts to drain the Koo Wee Rup swamps, including giving the Lang Lang River its first outlet to Western Port Bay. Lyall’s descendants lived in Harewood House until 1968 when it was sold, with contents to the Balas family, whose son Glen still owns the Tooradin Airfield which was originally part of the estate. The Balas’ did extensive restoration / renovation work in the late 1960s.The Macwhirter family acquired the property and contents in 1991, including much original furniture, memorabilia and the Lyall’s original 600 book library and are the current owners. Both house and contents have been designated of State significance by Heritage Victoria. Harewood is a large picturesque stuccoed brick house. The front part consists of two separate single storey hipped roofed sections with a separately roofed hall between. The hall originally had a hipped roof and a small porch; by 1890 it had a gable with decorative bargeboards and a larger gabled porch also with bargeboards. The hall, which is a feature of the design, is covered with glass and timber. The rear of the house consists of a two storeyed L-shaped section, with a small porch over the back door and a two storey timber verandah on the side facing the bay. The roof is of corrugated iron.